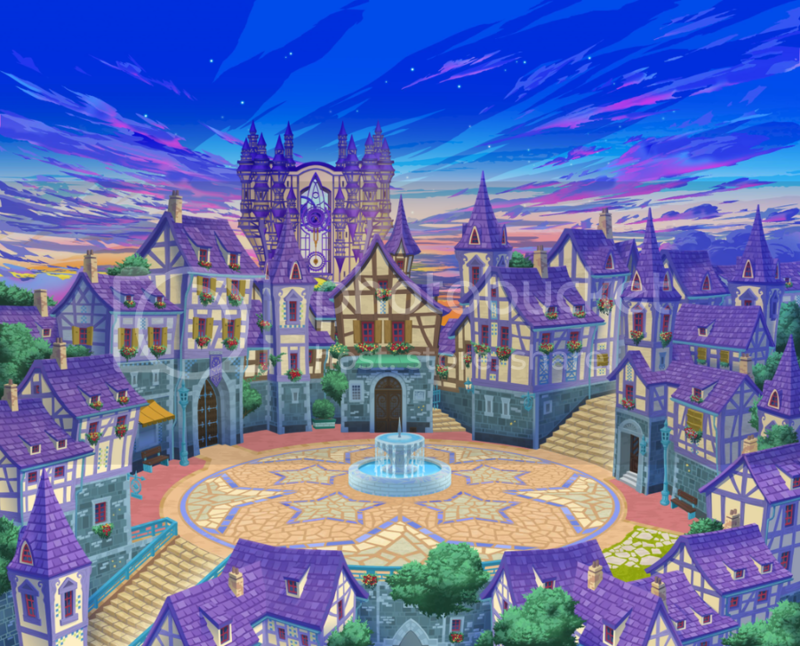 Within Daybreak Town there was a large castle complete with a clock tower. Behind this clock was a laboratory occupied by a woman cloaked in black. Her entire face and body were obscured, but she still waited. It seemed that she was waiting for someone in particular. On her desk were six copies of book one of them belonging to her, and the rest. Well, she sent out a message to have one of her students join her. A girl by the name of Masa. She'd continue to wait for this girl, and while she did... she continued working. "I suppose I really might disappear from this world..." she said to herself. Her hands furiously scribbling away on some random piece of paper. A few moments into her writing it seemed that the Master was meant to be joined by another. A singsong voice would come from the woman as she gave answer to the knock on her door. She even rose from her seat actually moving to open the door. The deviousness of this woman appearing in a brief moment as she spoke to the door. "I wonder... who could be knocking on my door?" she asked as she pulled it open standing in a small crack within the doorway. "Oh, it's you Masa~ To what do I owe the pleasure of a visit with you today?" she questioned as if she had no idea what this young woman was doing here. This was a said in a very convincing tone, it was as if the Master had completely forgotten that this young woman was supposed to be here. Though her face couldn't be seen, she seemed to furrow her brow in curiosity about the singing coming from the other side of the door. Before her thoughts could trend further she head a voice followed by the opening of the door to see her master through the crack. At the sight of her master she bowed her head out of respect, she always greeted those of equal or stronger status in such a way so for the young girl this was normal. "Master...you called for me." she replied, glancing at the person shrouded in black with some concern, it wasn't to be seen. The Master found this girl's slight servitude to be somehow amusing. But the woman hidden in black didn't seem to want to say anything about it. No, in fact she wasn't even phased by this young woman's shock. The words, that she'd been summoned by the woman made her jump back, allowing the door to open a bit wider as she held an arm up in front of her person to demonstrate her surprise that she'd been the one to summon the girl wearing the unicorn mask. "Did I? Oh well... I don't want anything." she said reaching forward to slam the door in the young girl's face. After the thud was heard she'd wait a total of three seconds before opening it up again. "I'm kidding. Come in... I finally figured out what I need from you. And I have something for you... well technically a couple of somethings." she said moving away from the now open door to let the girl enter without any further teasing. She watched her masters bizarre actions before having the door slam in her face. She could only be puzzled for a brief moment, before the door reopened, this time it'd seem her master was done toying with her. Though she'd served under her for quite sometime, the only thing she knew about her master is that she was unpredictable and outlandish. She let out a small sigh as she followed The Master into her office. As she walked she continued to listen as she was spoken to. She perked up at the trail of her masters last sentence, "It would be an offer I'll be glad to accept." She stopped in the middle of the room to wait for a response. "That's weird, you totally shouldn't accept before you know what it is." the Master spoke these words as she took her seat back in her chair then kicked up her feet, leaving the chair balancing on its back two legs. She seemed to have something she needed to discuss with the girl in the mask, and she'd get to it in due time. "To be honest... I could disappear. Fade into nothingness... without any notice." she said. These words were completely neutral from cloaked woman. Of course, she knew this would probably be shocking information for the scarlet haired young woman, she also knew for a fact that the girl could take it as a joke. "And when that happens you'll need this." she said. But there was much more to be discussed than that. Soon the cloaked woman held out her right hand in front of her materializing a Keyblade in a flash of light. This Keyblade was different; a white color pattern with a unicorn at its guard, a black handle, surrounded by cloud designs. It has Terra's Mark near its tip, and spiky teeth featuring a dark blue crescent. Its chain and trinket both share the star-like flower motif of its blade, and its trinket holds a Gazing Eye. "Take this. Go ahead, it won't bite. Quite the opposite most times~" she mentioned with a bit of a chuckle, as she waited for the girl to accept this inheritance. The scarlet-haired child would choose not to give a reaction to the first bit her Master spoke, more so to keep from walking into another trick. Yet she could help but speak when the Master spoke of fading, though Masa knew better than to believe something so foolish. The young girl giggled, "You're the strongest of all...", she paused before finishing her sentence this time her tone was softer than before, "And even if you were to disappear, I'm sure all of us as a whole would notice." The stun from her Master's previous sentence was completely worn off before she was presented with a peculiar Keyblade. She locked eyes with it as if it were calling out to her. Masa walked over to the Master, and hesitated a moment before grasping it in her hand. She held it up to get a better view of her gift. She couldn't even say words of thanks with how astonished she was at receiving such a valuable gift. She regained herself then spoke properly, "Master...I love it and I'm grateful but is this okay?" She didn't question this out of disrespect but out of slight disbelief. She gazed at the Keyblade for a moment before lowering her hand to her side. She turned her attention the Master once more, "Master?" Last edited by Kiyomi; 01-31-2017 at 09:53 AM. "Well, I mean... if you're gonna stroke my ego, I shouldn't stop you~" the Master chimed. She, realized that this girl and likely most of the others would think her the strongest of them and this was true. But in this moment there was still more to say. "Oh? Planning ahead to the just in case part? That's nice, it's good... it's kind of your job now anyways~" said the woman behind the cloak. "That's just like you Masa... hmm.. but we can't call you that now that you're officially a Master. Just like me...." she said as the girl looked over her gift, which was the crowning achievement of her day. Moving right along the girl seemed to wonder if she should accept the gift and the Master simply drew back both her hands in mock disbelief. "What? Of course you can accept it, if you didn't... then I'd have to keep it... I dun wanna." she said wiping away fake tears. "Though... I should be fair." the woman said as she allowed the weight of the chair to shift so that she'd fall forward and soon shift to her feet with no warning. "That Keyblade comes with a few perks and responsibilities." she mentioned as she began pacing. "The responsibilities first, they're a bit annoying... you're a Master now... so you get a new name... let's call you... Ira. Yea... Master Ira. And Master Ira, it will be your responsibility to build a Union under the name of your Keyblade there, Unicornis. You also have to take this book." she said walking by her desk and picking up a copy which had a color motif which matched the girl's mask and had on the cover an interesting picture of multiple layered things and a unicorn insignia. "We'll call that , the Book of Prophecies. And you now have a copy. It tells the future... you can use it to help you better lead your union. It will tell you the future events of this place..." she said seemingly amused by the information. "Oh, and if I disappear. You'll be in charge of the others. So you gotta remember what's important. Keep the balance. No affiliations or alliances between different unions okay, you have to keep the power balanced. Think of it as a game which leads to friendly competition... but never co-operative, as far as unions are concerned. I am going to tell the others this too, but it's a necessity." she said the importance of that final point couldn't be stressed. "May your heart be your guiding key." she said with a bow to her newly crowned master. "Oh... any questions about all that stuff... it was kind of a lot I know. If you have none, you can totally just go, test out your new Keyblade, or read that book... I know you wanna."